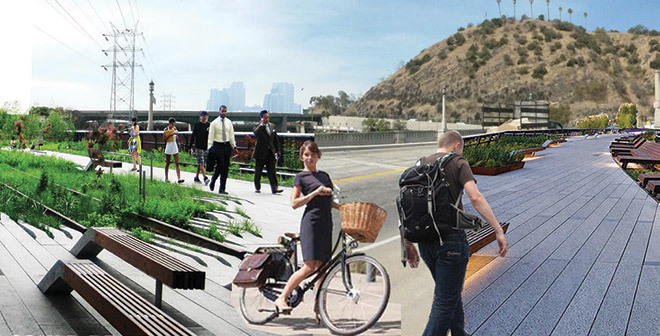 Is a doomed overpass L.A.’s answer to the High Line? In 2011, New York mayor Michael Bloomberg celebrated the completion of the High Line, a 1.5-mile path of old freight rail that’s now a Manhattan landmark. L.A. conservationists and architects are now lobbying for a similar transformation here, with a plan to turn the Riverside-Figueroa Bridge, which attained Historic Monument Status in 2008, into an urban park. But first they’ll need to save it. The 76-year-old steel-truss structure, which spans the L.A. River near Dodger Stadium, is scheduled for demolition this summer, to be replaced by a new bridge a mere Frisbee’s toss away. “Instead of spending money to destroy something, let’s do something world-changing for these communities,” says Tomas O’Grady, executive director of EnrichLA, the nonprofit behind the Land Bridge at Figueroa project. The proposal, which preserves the old bridge, includes a 170-foot-long area with bike paths, playgrounds, and a glass floor for a river view. A conservative estimate to rehabilitate the space starts at $15 million, which our city can’t afford—but a wealthy patron could. The High Line exists in part because private citizens raised $44 million. May we suggest the Eli Broad High Road?